BEIJING, Nov. 22,President Xi Jinping on Thursday met with Kazakh Prime Minister Bakytzhan Sagintayev in Beijing, and suggested that both sides focus on policy synergizing and well implement the alignment of China-proposed Silk Road Economic Belt and Kazakhstan's Nurly Zhol (Bright Path) economic program. Xi asked Sagintayev to give his cordial greetings to Nursultan Nazarbayev, president of Kazakhstan. With close contact, Xi said his important consensus with Nazarbayev on many issues had guided the development of bilateral ties. "The consensus is being implemented by solid steps with the two sides' concerted efforts," he said. "As a friendly neighbour and comprehensive strategic partner, China places high importance on developing ties with Kazakhstan." 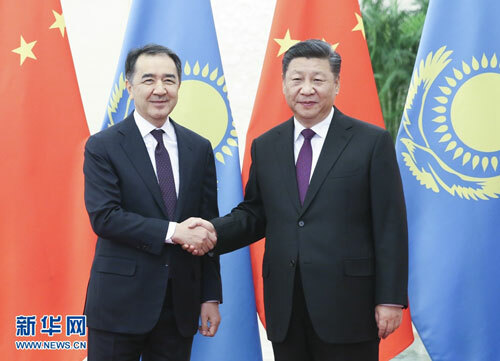 He voiced his appreciation of Kazakhstan's people-centric development principle, and stressed that China firmly supported the Kazakh people in following a development path suited to national conditions. This year marks the fifth anniversary of the China-proposed Belt and Road Initiative. "Over the past five years, cooperation under the initiative has delivered tangible benefits to the people along the route, and injected new impetus to the world economy," Xi said. "China appreciates Kazakhstan's firm support and active participation in the Belt and Road cooperation. The two countries enjoy a solid basis and promising prospect for jointly building the Belt and Road." Looking into future cooperation, Xi called on both sides to step up policy coordination, further synergize the Silk Road Economic Belt construction with Kazakhstan's Bright Path economic policy, and map out exchanges in various fields. Sagintayev conveyed Nazarbayev's cordial greetings to Xi. Calling China a friendly neighbor, close friend and strategic partner of Kazakhstan, Sagintayev said his country highly valued the Silk Road Economic Belt Initiative proposed by Xi in Kazakhstan five years ago. "The initiative is of great significance to strengthening regional connectivity, combating global challenges, maintaining world security and stability, and promoting common growth and prosperity," he said. The Kazakh prime minister recalled Xi's keynote speech delivered at the opening ceremony of the first China International Import Expo earlier this month, when he compared the Chinese economy to the ocean. "Kazakhstan hopes the ship of Kazakhstan-China cooperation will keep sailing in the ocean of China's economy," Sagintayev said.